UCLA Prof Khaled Abou El Fadl Condemns ISIS, but Does He Condemn Islamism? Originally published under the title, "UCLA Prof Khaled Abou El Fadl Condemns ISIS, But Does He Condemn Stealth Jihad?" Khaled Abou El Fadl, a law professor at UCLA, has a history of equivocating on unsavory aspects of Islamism. Given the apologias for the Islamic State (ISIS) barbarism from the ranks of Middle East studies, it was encouraging to find the University of California, Los Angeles hosting the recent lecture, "ISIS's Enslavement and Trafficking of Women." 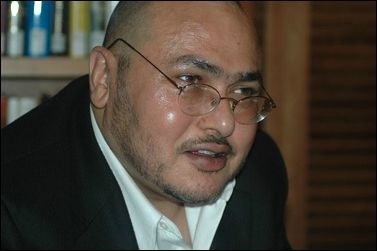 The speaker, Khaled Abou El Fadl, Omar and Azmeralda Alfi Distinguished Professor of Law at UCLA, has a history of equivocating on Sharia (Islamic law) and other aspects of Islamism. Yet, in this instance, he provided insight into the regional, cultural, and ideological influences underlying ISIS's crimes, albeit in a rambling, disorganized manner. A room reserved for 150 people at UCLA Law School swallowed the thirty who attended, a mix of students, parents, and faculty members. Perhaps embarrassed at the low turnout, Abou El Fadl stated at the outset: "There are tons and tons of people who believe they know and speak as if they know" about Islam, "but have very little interest in actually learning anything." He further assured the audience that, "numbers do not reflect quality, so I will believe as a matter of conviction that you are worth a thousand because you are special people." These "special people" soon discovered just how elusive was the subject of Abou El Fadl's lecture, for he spent the entire first half discussing human trafficking, only occasionally referencing ISIS. After explaining that "It's not very effective to take an issue out of the totality of its context," he promised to eventually "get to the Muslim context of these things." ISIS doesn't invent the idea out of thin air. One of the videos in which ISIS is auctioning off women after a battle . . . the ones who are enthusiastically bidding on the product are clearly from the Gulf region. If the jurists [Muslim scholars trained in Islamic law] tell ISIS enslaving people is wrong, the response will be, "You're hypocrites, you engage in it all the time." . . . ISIS is a very particular and specific animal that is symptomatic of much larger ideological movements that are problematic in their core. On ISIS's enslavement of Yazidi women, Abou El-Fadl described how, "ISIS trafficked in minorities that were not people of the book [Christians, Jews, or Muslims], hence they were declared booty of war." "For ISIS, Shia aren't Muslim, either, so that's okay," he added, while its Sunni victims fall under the rubric, "If they didn't pledge allegiance to us, they are apostates and fair game." Once people start sneaking out, it's a sign that everyone is getting bored. I could lose myself in this stuff forever. I promise you I'll try to contain myself. Then, after a beeping sound interrupted his resumed soliloquy, he said to no one in particular, "This is my pill alarm," but "I'm not going to take my medicine right now." He was met with uncomfortable silence. Islamophobic books that compile what they describe as every grievance committed by Muslims against Christians or against Jews, whether historical or not historical. Al-Suri does the exact same thing, but from the Muslim side. After the question and answer period concluded and, with it, the podcast recording, Abou El Fadl spoke candidly for another forty-five minutes with a small group of people. He raised the subject of human trafficking in Israel, which, according to the U. S. State Department's 2014 annual report on the subject, the country has made a concerted effort to combat. When pressed on Israel's superior human rights record in the region, Abou El Fadl replied, "Well, not as far as the Palestinians are concerned. You know, they're an occupying country." I see this a lot among young, American, enthusiastic Zionist activists. . . . It's time for American Jews to confront the fact that Israel has a human rights problem. . . . They are among the systemic users of torture and humiliation against people in the prisons. Despite such prevarications, Abou El Fadl's lecture was, in the end, illuminating. However, like the 126 Islamic scholars who penned an open letter to ISIS leader Abu Bakr al-Baghdadi disputing the theological basis for the group's heinous methods, while sharing Islamist goals such as implementing Sharia law in the West, he is not disinterested. While ISIS terrorizes and conquers Middle Eastern populations, the Khaled Abou El Fadls of academe work to undermine Western culture from within, whether through soft-peddling Sharia, pushing blasphemy laws, or branding critics of these aggressions "Islamophobes." As such, a condemnation of ISIS does not necessarily extend to the much broader problem of Islamism. As Zuhdi Jasser, founder and president of the American Islamic Forum for Democracy, put it, [T]hey haven't changed the drug, and the drug is Islamism, the Islamic state [concept], caliphism, and jihadism. Until we as Muslims condemn them as a whole, they are always going to end up feeding into radical groups. Adelle Nazarian is a journalist and contributor with Breitbart News, who has reported extensively on politics, national security, Asia, and the Middle East. She co-wrote this article with Cinnamon Stillwell, the West Coast Representative for Campus Watch, a project of the Middle East Forum. Stillwell can be reached at stillwell@meforum.org.